A region well-known for its importance in America‘s early history, the Boston Harbor area offers a myriad of gorgeous locations that are great for wedding day photography shoots. Begin your photography session at the Boston Public Garden, famous for being the nation’ s first public botanical garden. Let the intricate paths lead you and your bridal party through the garden as your photographer captures the vibrant flora all around. The numerous monuments and the placid lagoon will serve as perfect backdrops. The bride and groom can even glide around the lagoon in the garden’s famous swan boats! After you’ve finished strolling around the garden, have your limo driver take you and you bridal party to Beacon Hill, just a few minutes away. This National Historic District is truly a part of Boston’s living history! Here you’ll find the magnificent Massachusetts State House with its shining gold dome - a wedding photographer’s dream. Passing farther along Mt. Vernon Street (dubbed the most beautiful in America by Henry James), you won’t be able to resist taking photographs under the beautiful old elm trees. Finally, take your limousine over to the Christopher Columbus Park, located right on the waterfront. Besides offering a stunning view of the harbor, the park is famous for its intricate wisteria-covered walkway - a great spot for a portrait of the bridal party or just the bride and groom. 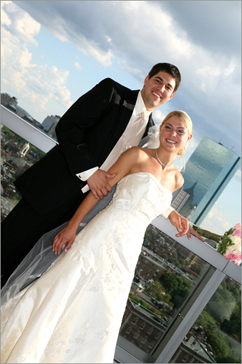 You won’t regret choosing the Boston Harbor area for your wedding photography session! Even more famous than the historic landmarks in Boston are two of the city’s world-renowned universities, MIT and Harvard, each of which offers its own beautiful and unique campus. Boston’s prestigious Massachusetts Institute of Technology offers plenty of stunning architecture that will have your wedding photographer salivating! Building 10, with its towering Corinthian columns, elegant steps, and Great Dome is a great place to begin your wedding photography session. This building overlooks Killian court, whose grand verdant lawns will provide a perfect backdrop for a portrait of the bridal party. You can also venture inside Building 7 atrium, which has a tremendously high ceiling and windows that are second to none. The dazzling glass-covered Kresge auditorium (a classic example of post-war architecture) is also a great place to shoot. 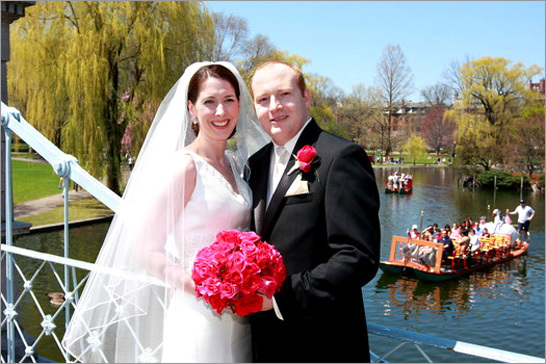 As your limousine driver takes the bridal party across the Charles River toward Harvard Yard (the university‘s main campus), stop and take a photograph of the bride and groom on Boston’s Harvard Bridge, with the glimmering water streaming in the background. As you explore America’s oldest university, you will find no shortage of beautiful locations for your wedding photography session. Have your photographers assemble the bridal party on the lush greenery of Harvard Yard or in front of the elegant colonial style Memorial Church. Sever Hall and University Hall, both National Historic Landmarks, can also serve as wonderful backdrops for your wedding photos. 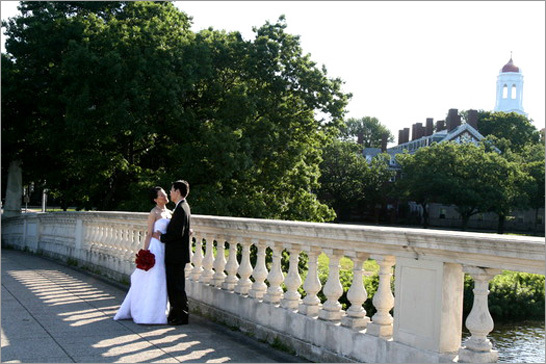 You’ll be glad to have chosen two of Boston’s premier learning institutions for your wedding day photography session. Explore some of Boston’s greenest treasures during your wedding photography session in the area known the Emerald Necklace - a 1,100-acre chain of parks and waterways in Boston and Brookline, Massachusetts. Begin your wedding photography shoot in Franklin Park, considered the ‘crowned jewel’ of the Emerald Necklace. Take photos beside the peaceful Scarboro pond or on the famous 99 Steps, a set of stairs carefully built into the steep hillsides of the park. Have your wedding photographer use the park’s famous Ellicott Arch for an intimate portrait of the bride and groom, or you can pose on any one of the park’s little bridges. Once you’ve finished exploring the park, head over to the Arnold Arboretum, located just a few minutes away. Cared for by Harvard University, Boston’s Arnold Arboretum offers 265 acres of expansive greenery that is perfect for wedding photography portraits. After you’ve exhausted the arboretum’s vast collection of trees and lawns, head up to Peters Hill, the highest point in the Emerald Necklace. You’ll marvel over the its magnificent view of the entire Boston Skyline. Have your wedding photographer arrange the bridal party on the steps of the crimson, brick Hunnewell Building - the arboretum’s headquarters. Finally, take a short limo ride over to the tranquil Jamaica Pond. After your wedding photographer snaps a photo of the bride and groom at the entrance gate, ask to take some relaxed and casual pictures as you meander around the pond along its beautiful pathway. The deck leading out toward the water will serve as the perfect place for a photograph of the embracing bride and groom. Once your wedding photography session is over, you’ll be convinced that Boston’s Emerald Necklace is truly a wonder to behold.